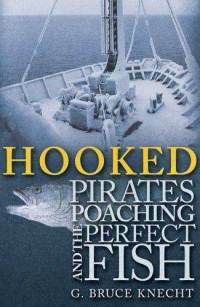 I recently read G. Bruce Knecht’s Hooked: Pirates, Poaching, and the Perfect Fish. It’s the tale of the Viarsa, an illegal fishing vessel that was caught in the act and ran for it. This led to the longest maritime pursuit in history and a very high profile court case in Australia. It makes for a good read for just about anyone, and a truly great read for those interested in marine policy. Knecht does a great job of teaching the reader about the murky world of organized fisheries crime. A Spanish fishing company. Crew from around the world. An Uruguayan flag. Tampered vessel monitoring system. Documents thrown over the side. A high seas chase. And a legal system that makes the burden of proof truly burdensome. Sprinkled in are tales of NOAA fisheries enforcement agents closing in on other illegal fishing crime bosses in the United States. The story-telling put me off at first, but ultimately grew on me. That’s because it’s a non-fiction narrative, with events unfolding chapter-by-chapter, and our characters are left uncertain about what will happen next. It reminded me a little of Mark Bowden’s Black Hawk Down or Robert Kurson’s Shadow Divers (a truly epic book for all those divers out there). Not exactly what I was expecting for an ocean book. BUT, because it was told bit by bit, I was able to slow down to really process some new aspects of illegal fishing. Among them are the mortal dangers of illegal fishing in the Southern Ocean, the complexity of fish laundering schemes, and the lengths that illegal fishermen will go to cover their butts, like lying through their teeth in court. Bengis [an illegal fishing financier] developed a convoluted method for bringing toothfish into the United States: many of the shipments were off-loaded in Walvis Bay, the port where Perez [another illegal fisher] had taken three loads of toothfish. It was a perfect landing point for pirates. If the fish landed in South Africa, the inspectors who greet most commercial fishing vessels there probably would have discover that Hout Bay [Bengis’ vessel] did not have the necessary permits to catch, possess, process, or export toothfish. Walvis Bay had excellent infrastructure, but its regulatory capacity was extremely limited. For several years, a single inspector was responsible for monitoring every arriving fishing boat. He generally did not see the ones that visited at night. Knecht could not have written this book without the participation of the illegal fishermen. They had clearly broken the rules…and yet they opened up to Knecht enough to provide him with their thoughts on illegal fishing, their career histories, and feelings during the high seas chase. This is a truly amazing feat. The only negative aspect of the book is that it quickly slaps you back to reality with the ending. It reads like a suspense novel and it’s easy to forget that it’s not a fiction set in a world where fisheries are appropriately managed. No, it’s set in the real world, so after one mistrial, the illegal fishers are found ‘not guilty’. Yes, another depressing story in the world of marine conservation. For the big takeaway, the book effectively shows that traditional enforcement on the high seas is too costly and ineffective to use it much at all. By implication, new enforcement techniques are needed.